I’ve been thinking about this line, the distinction if you will. Most people seem to be able to tell whether they love someone as a friend or as a potential partner, but I just don’t? Aesthetic: wow that person is good looking, or maybe their style is just perfect. Something about the person will make me want to either sit and watch them jut going about their life (not in a creepy way, I promise!) or make friends with them- if I’m brave enough. Platonic: I want to be friends with this person/if I’m already friends with them I want to be closer. This is someone I like and want to get to know really well. Strong platonic: I know this person well and it feels like they’re family. I just want to see them a lot. I probably miss them if I don’t see them for a while. The thing is, I occasionally get really strong sensual attraction. Like, ‘I need you to hug me right now’, or ‘I want to spend all of my time with you’ type feelings. And I don’t think this is inherently romantic, as it doesn’t feel romantic- even though I don’t know what that feels like. Does that make sense? Only certain people cause this craving for attention, its not just me being needy. And it varies as to how well I know them too, so its not that once I’m close to someone I want them to give me all of their attention. It tends to be people that are really similar to me so it would make sense for it to be me having a ‘crush’ (I hate that phrase) but…no. I’m not romance-averse, I just don’t really get the feeling of being ‘into’ someone. 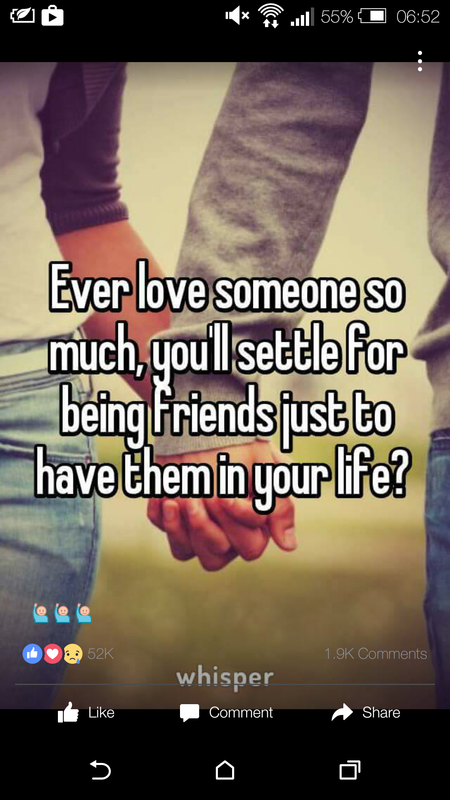 I have certain people where my thoughts regarding a relationship is “well if they wanted to give it a shot, why not”- so although I wouldn’t pursue that course of action I’d be happy to give it a go but maybe thats me being curious because I’ve never been in a relationship or just wanting a reason to have a super close best friend. These are the people that I feel similar to, the ones that I want to spend all my time with, that trigger this. So maybe it is romantic attraction. Who knows? Certainly not me. One of my friends on Facebook liked this picture the other day. As an aromantic, it’s the kind of thing that makes me sad and angry, the idea that romantic love is the highest form of relationship you can have with another person and that other forms of relationship are somehow inferior. Its the use of the word “settle” that bothers me about this more than anything. Friendships are not weaker or less important than romantic relationships, there are all sorts of bond that people can have and none of them is any more special than the other. The idea of settling for someone as a friend rather than a romantic partner massively simplifies the complex range of emotions that people can feel towards others; I love my friends dearly but its completely platonic, and different to how I love my family. Not all love is romantic. Not only romantic love is important. It’s strange how things change. People being in relationships when I was at school was fine but now those same people are in relationships and it just sends up red flags in my mind. It’s more serious now, its not kids messing around. These people have changed, they’re Proper Adults now. Some are getting married or having children. My Facebook feed is full of baby photos and engagement announcements. Everything is moving too fast and I’m not moving along with it. Family members ask me if I have a boyfriend yet whenever I see them (most have given up seeing as I just answer something like “Nope, not interested”). I just want less expectations that everyone is going to find a partner and settle down and have a family. I want to go back to how it was when nothing was serious or permanent. I want to shatter the sympathy that I’m given when people find out I’m still single. Just because I don’t fit into the cookie cutter timeline doesn’t mean I’m not becoming a Proper Adult too. I’m also changing, growing, just in a different direction to most other people. I wish things didn’t have to change. I wish we could just stay in that carefree place in which children live, where romantic relationships aren’t the most important form of bond you can have with another person. Where you’re not the black sheep for being single. My favourite lesser known fact about St Valentine is that he is the patron saint of (among other things) bee keeping and plague. And isn’t that what the 14th of February is all about? Valentines day can be tough for single people, but as a member of the aromantic community it’s a massive heart shaped slap in the face; a reminder of how society is not designed for us. Pink and red displays appear everywhere, decorated with hearts and aggressively advertising their products, because this one day of the year seems to be the only time at which couples buy each other gifts to show how much they love each other. Don’t get me wrong, I don’t have a problem with the idea of Valentine’s Day- just how forced upon you it is. Recently, I’ve snorted at strawberries that just for the occasion have hearts on the packet and come with a chocolate dip. The bunches of flowers stacked up way higher than normal got a comment along the lines of ‘Who died?’. I’ve sarcastically asked my friend if she wants some chocolates that are exactly the same as the normal ones but in a heart shaped box, so of course they’re more expensive. I enjoy being surrounded by single friends (even though they’re not single by choice) because right now they agree with me on how tacky the day is. It’s a lovely idea- to take a day to show your favourite person how much you care about them and treat them to their favourite things- but I feel like it loses some of its meaning when you’re only doing that because you’re expected to. Why not surprise them on May 9th with a bunch of flowers, or November 28th with a card and a neck rub? Why wait for a date predetermined by society? One of my friends said she kind of agrees with me but don’t we do the same thing at Christmas and birthdays? She also made the point that it’s a tradition thing which is sweet, it’s just that its so commercialised now that she can see where I’m coming from. When asked, I said that its not that I’m against the day- its just that its a massive reminder of how expectations are that everyone will settle down into a happy relationship at some point. That’s just not for me. Granted, I don’t understand any of this so this is just my outsiders’ view and I guess it makes perfect sense to those who celebrate it. It’s just that in general we’re surrounded by relationships everywhere you look and February can get intense if you’re trying to avoid that kind of thing, so I find that the best way to deal with it is to laugh. If Valentines Day is about showing the most important person in your life how special they really are, do just that and treat yourself like royalty. Take that bubble bath, cook your favourite meal, buy yourself some heart shaped chocolates. Don’t let the amatonormativity get you down. Because February 14th is about love, and the most important form of love is self-love. The idea is great. Continue the story, put your favourite characters in an alternate universe or situation not in the original plot, or change what happens. And I’d love to read more fanfiction, I really would, but so much of it is based on placing two characters in a romantic and/or sexual relationship. I don’t have a problem with people writing about relationships- a lot of it is very well written and enjoyable- but sometimes I just get frustrated that I don’t relate to any of it so tend to avoid the area altogether. I guess my irritation is based on the fact that I occasionally want to immerse myself back into one of my favourite universes; to get to know the characters from a different perspective or hear them have conversations that the books didn’t cover, but I can’t seem to do that without having to confront a couple. I get that the vast majority of the population is not aromantic and asexual and this type of writing is enjoyable rather than uncomfortable, so I’m in the minority in asking for just friendship stories to become more of a trend. I Just feel that romance is so ingrained in every form of media we consume that it would be nice to have a space in which it doesn’t form a massive part, a space where platonic relationships are valued as highly. Heck, it would be nice to have more of a balance in all types of media- is romance really that central to alloromantics’ lives that it has to be the centre of all plotlines? I’ve come to accept that pretty much any book, film or television series will involve romantic plotlines but finding that fanfiction follows this pattern was quite simply disappointing. Whether I like it or not, I’m not the target audience for a lot of fanfiction. So for now I’m stuck reading (when I very occasionally dip my toe into the waters of fanfic) a really limited selection. Don’t get me wrong, I have some favourites that I go back to because they feel like getting a hug but it would be nice to have a wider selection. It’d be nice to be able to read anything I choose without it making me feel uncomfortable and isolated. I can’t be the only person who feels like this, surely?